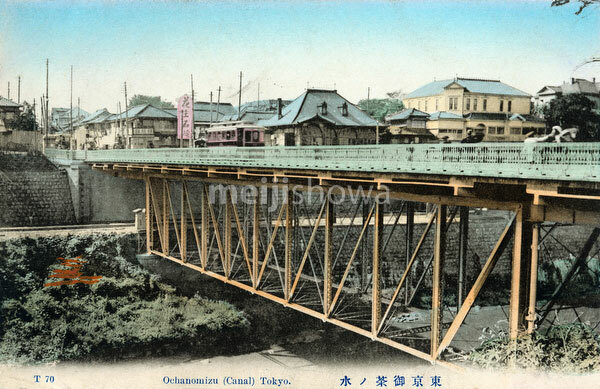 The Ochanomizu-bashi Bridge (御茶ノ水橋) in what is now Chiyoda-ku and Bunkyo-ku, Tokyo. Built in 1891 (Meiji 24), the bridge crossed the Kandagawa River (神田川). The 15 meter long bridge was Japan’s first steel bridge designed by a Japanese engineer. It was destroyed in the Great Kanto Earthquake (Kanto Daishinsai) of September 1, 1923 (Taisho 12).